I was going to call this post Jealousy, but that's not a really good word. I'm not sure envy is any better, but when I think of jealousy, I think of wanting what someone else has and wishing they didn't have it. When I think of envy, I think I wish I had that, but good for them for having it. I'm envious of Bjorn over at Bonefish on the Brain. He is getting ready to go to Cuba on what is going to be a fantastic expedition. He's going as part of a group led by Yellow Dog Flyfishing. 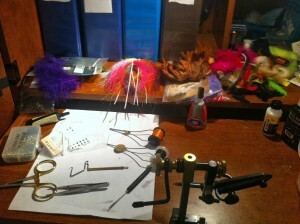 On his blog, he's been busy getting rods, reels, and flies ready to go. For my last trip I must have tied 30 new flies. I used three. 1. Bonefish on the Brain and The Bonefish Flat MUST get together sometime to go bonefishing. 2. Have the trip of a lifetime. We are all anxiously awaiting the reports. We do need to fish together at some point... that needs to happen. My daughter and I counted up the flies on my cork board, which is the holding pattern for flies from when I finish a fly until it goes in a box. There were 70... and that's after I already put 20 or so new bonefish flies in boxes. The trip is a media tour with Yellow Dog and Avalon, but YD isn't selling the trip. They will, when it is legal to. I'm at 6 days to go. A week from today I'll be in Havana, waiting to head down to the fishing waters, 50 miles off the southern Cuban coast. Yo, I'm also in the jealous boat and kinda green w/ envy (and possibly a little sea-sickness thinking of the the 50 mile trip over water to get to the fishing grounds). Still, sickness of the deepest kind. Also, don't know how I missed it but you are now added to my "blogroll". Glenmorangie's 'The Lasanta' is one of my favorite single malts. Bjorn, the trip is going to be off the hook. Hope you get a Cuban cigar following a grand slam.